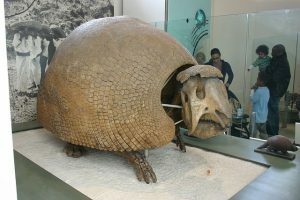 The giant armadillo found in South America is the largest armadillo in the world. It is known locally as tatu-canastra, tatou, ocarro, tatú carreta. 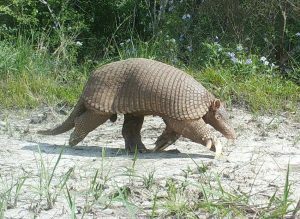 Size: Giant armadillos usually measure around 30-39 inches (75-100 cm). Weight: Adults weigh at around 41-72 lb (18.7-32.5 kg). There has been an individual found in the wild that was 119 lb (54 kg); captive giant armadillos have been recorded to be up to 180 lb (80 kg). Color: The heads are a pale yellow-white. Their bodies are dark brown, with the sides having a yellowish band. 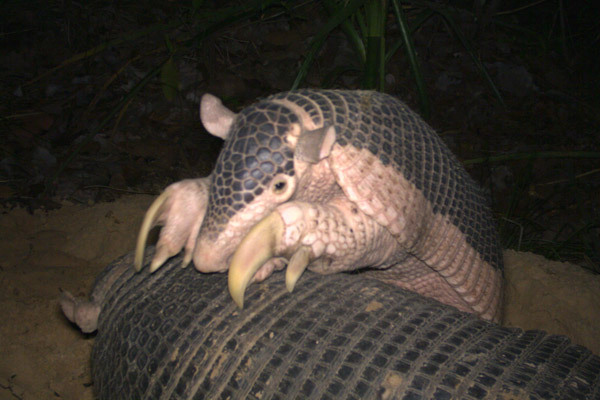 Dentition: Giant armadillos have up to a 100 teeth, more than any other terrestrial mammal in the world. These armadillos have a wide range of distribution, being found throughout most of Northern South America east of the Andes Mountains. Their range, however, does not extend to the eastern parts of Brazil and Paraguay. They inhabit areas with high termite populations, typically at heights of up to 1640 feet (500 meters) in and around rainforests, both tropical and subtropical, floodplains, grasslands, and semiarid and arid woodlands. 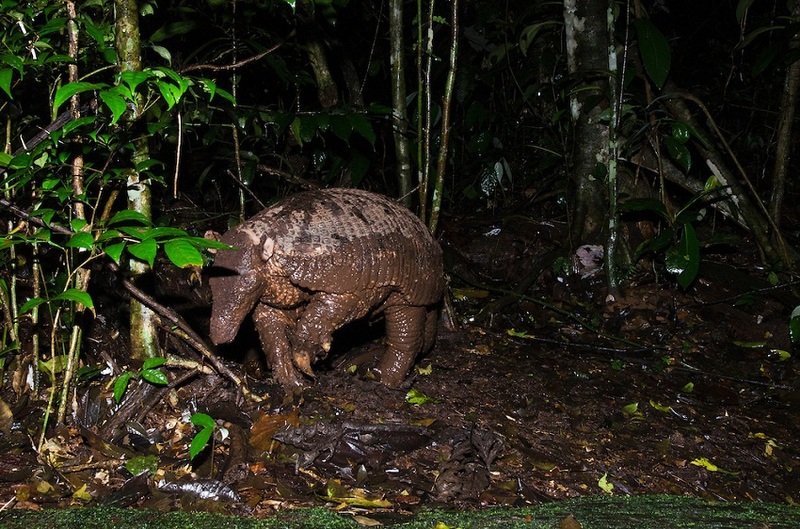 Giant armadillos are nocturnal and are active mostly during the night, and spending the day inside burrows. They are terrestrial, spending their life on the ground. They are solitary animals, getting together with others of their kind only to mate. 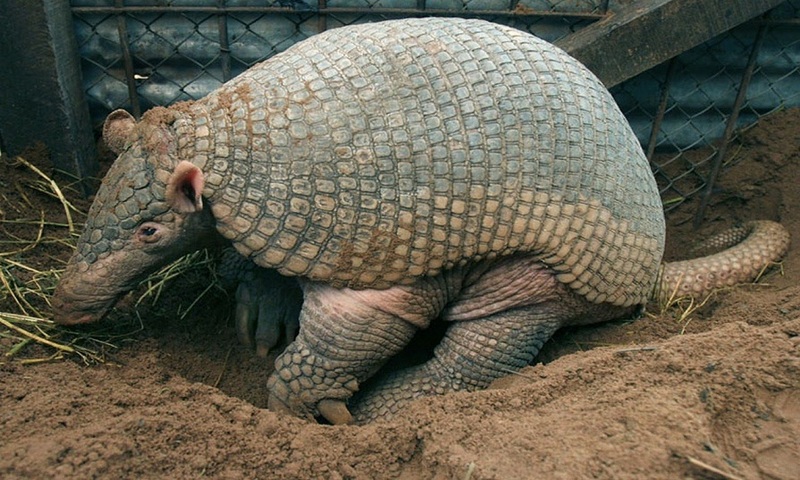 They make large burrows with entrances up to 17 inches (43 cm) wide, and opening towards the west to avoid sunlight. Giant armadillos feed primarily on termites and a few ant species. They may also take worms, small vertebrates, and even carrion, if necessary. 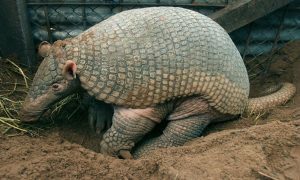 Not much is known about the mating habits of giant armadillos. During the breeding season, they get together and share the same burrow. Usually, one (sometimes two) offspring is given birth to after a gestation period of 4 months. The offspring usually weighs 4 ounces (113 gram) at birth, and are born with armored skin. They are weaned at around 6 months of age, and around the same time, they become independent. Both sexes become sexually mature at approximately 9 to 12 months of age. These animals usually live for around 12-15 years in the wild. 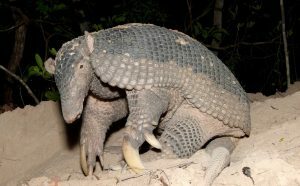 It is speculated that giant armadillos communicate with each other through mostly the sense of smell. Touch is also another vital form of communication between mother and offspring and mates. The central claw of these armadillos is enlarged, to help tear into termite mounds. They can balance on their strong hind legs and tail, and stand up to get high into termite mounds. It is believed that they are adept at swimming. 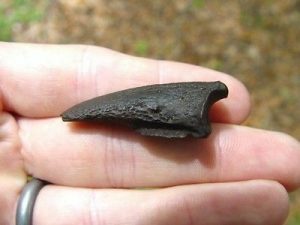 The bony scales on the carapace protect it from predators. The only animals with jaws strong enough to get through the armor of these armadillos are the jaguar and occasionally, the puma. 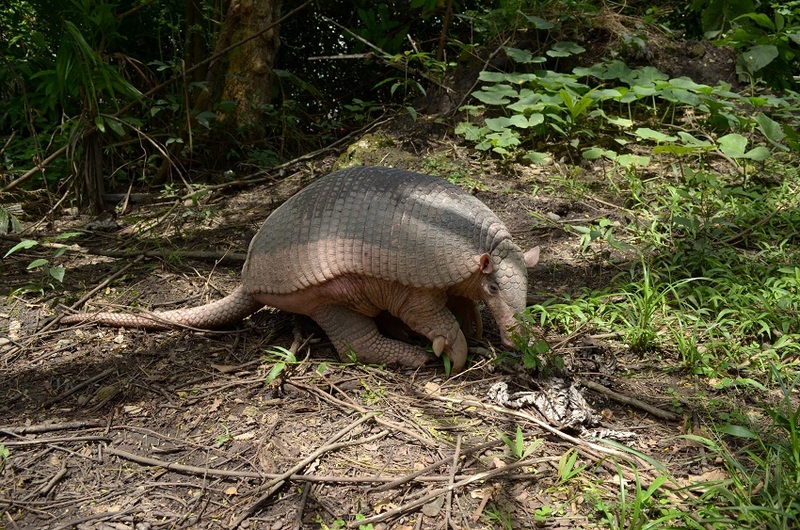 The IUCN lists the giant armadillo under their ‘Vulnerable’ category. It is hunted for meat throughout its range, as well as captured for trade in the black market. Its habitat is threatened by deforestation. Conservation efforts are underway to ensure that the downward trend of the population of giant armadillos is checked and that the species thrives. 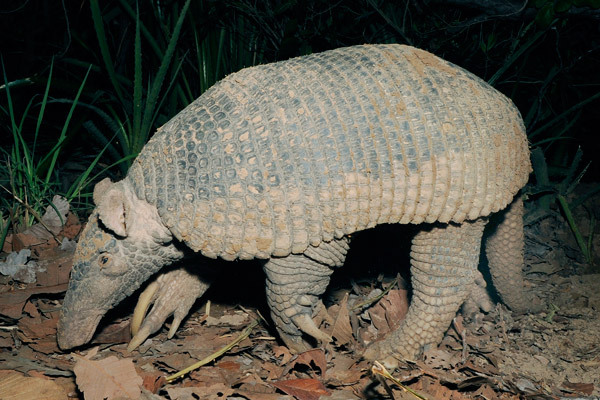 At present, it is roughly estimated that there are about 30,000 giant armadillos remaining in the wild. The giant armadillo is the only armadillo that cannot roll itself into a ball when threatened. Instead, it scurries away or digs its way out of trouble.